A Gyro compass is a form of gyroscope, used widely on ships employing an electrically powered, fast-spinning gyroscope wheel and frictional forces among other factors utilizing the basic physical laws, influences of gravity and the Earth’s rotation to find the true north. Master Compass : Discovers and maintains the true north reading with the help of gyroscope. Repeater Compasses : Receive and indicate the true direction transmitted electrically from the Master Compass. Course Recorder : Makes a continuous record of the manoeuvring on a moving strip of paper. Control Pane l: Governs the electrical operation of the system and ascertains the running condition by means of a suitable meter. Voltage Regulator : Maintains constant supply of the ship to the motor-generator. Alarm Unit : Indicates failure of the ship’s supply. Amplifier Panel : Controls the follow-up system. Motor Generator : Converts the ship’s DC supply to AC and energizes the Compass equipment. Gyro compasses are linked to the repeater compasses via one transmission system. The fast-spinning rotor attached weighs from 1.25 pounds to 55 pounds. It is driven thousands of revolutions per minute by another electric motor. However, the most essential part in a Gyro compass system is the spinning wheel, which is known as the Gyroscope. External magnetic fields which deflect normal compasses cannot affect Gyro compasses. When a ship alters its course the independently driven framework called ‘Phantom’ moves with it, but the rotor system continues to point northward. This lack of alignment enables it to send signal to the driving motor, which moves the phantom step in with the rotor system again in a path where the phantom may have crossed only a fraction of a degree or several degrees of the compass circle. As soon as they are aligned, electrical impulses are sent by the phantom to the repeater compasses for each degree it traverses. Gyroscopic Inertia : The tendency of any revolving body to uphold its plane of rotation. Precession : A property that causes the gyroscope to move, when a couple is applied. But instead of moving in the direction of the couple, it moves at right angles to the axis of the applied couple and also the spinning wheel. These two properties and the utilization of the Earth’s two natural forces, rotation and gravity, enacts the Gyrocompass seek true north. Once settled on the true meridian the rotor indefinitely will remain there as long as the electrical supply of the ship remains constant and unaltered and unaffected by external forces. Gyro compasses are pre-eminently used in most ships in order to detect true north, steer, and find positions and record courses. But due to the ship’s course, speed and latitude, there could appear some steaming errors. It has been found that on Northerly courses the Gyro compass north is slightly deflected to the West of the true meridian whereas on Southerly courses it is deflected to the East. 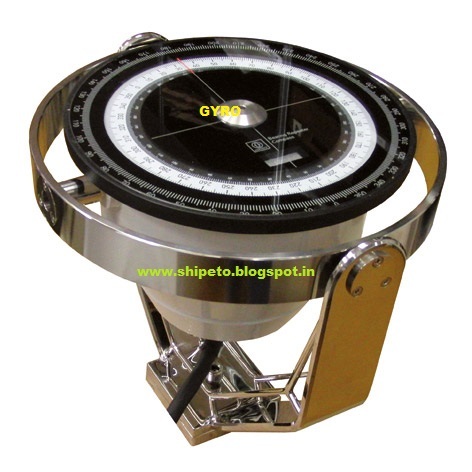 Modern ships use a GPS system or other navigational aids feed data to the Gyrocompass for correcting the error. An orthogonal triad of fibre optic design and also ring laser gyroscopes which apply the principles of optical path difference to determine rate of rotation, instead of depending upon mechanical parts, may help eliminate the flaws and detect true north. The magnetic compass work in conjunction with the magnetic field of the earth. It is used to get planned direction for the voyage.